January is French onion soup weather. Onion soup is the easiest dish in the world, but unless you start with first-class ingredients, you may as well buy it in a can. In fact, quality ingredients are so important that since there is no decent French bread available in my village, I had to start by making a batch of baguette -- no kidding. Mix the beef and chicken stocks in a separate saucepan and heat them up; keep warm. Peel onions, slice them in two lengthwise (from root to tip, to get two identical halves), and slice each half thinly along the length. Heat some butter or a mixture of butter and oil in a large frying pan, add onions and stir and stir until they start to turn golden brown; then add a teaspoonful of sugar and continue frying and stirring until the onions are a deep golden brown. They must not burn. If you're making a lot of soup, do this in batches and transfer each batch to a bowl while you fry the next batch. Combine all the onions back into the frying pan, sprinkle with a bit of flour and stir around until the flour has browned. Do this on medium heat so the flour doesn't burn. You just need a little bit of flour, just a tablespoon or two. Pour a splash of brandy and a couple of ladles of stock over the onions, and stir to dissolve the flour and all the brown residue at the bottom of the pan. Scrape this off well with a wooden spoon, then transfer the whole thing to your soup pot. Add more beef and chicken stock -- there must be more liquid than onions, about 1/3 more. Add a bit of salt and pepper, a few bay leaves, and simmer the soup on low heat for half an hour, just to meld the flavours, really, because the onions are already cooked. The oven should be preheated to 450 F (225 C) and the rack should be in the centre position. Heat some clarified butter in a small pan and fry the bread slices on both sides until they are just a nice golden colour. Taste the soup and adjust the seasoning if necessary. Ladle the soup into individual ovenproof tureens (or one large one, as in the photo), cover the surface with slices of fried bread, sprinkle grated Swiss-type cheese (not too much, please! This isn't pizza. ), and sprinkle a spoonful of real Parmesan if you have any. Place the whole thing on a cookie sheet or pizza pan or whatever (to catch spills and make it safer to handle when it's ready). Bake for about 10 minutes, or until the top is like the photo -- brown and bubbly and smelling like nothing else on earth. 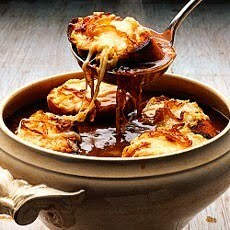 VARIATION: This onion soup is very good all by itself, or with a light sprinkling of Parmesan cheese. The reason I recommend slicing the onions as described above is that this way you get onion pieces in the soup. If you slice them across instead, the onions tend to dissolve and disappear. The size of the pan, the amount of heat, the amount of fat and the amount of onions in each batch must be such that the onions start frying right away, without rendering their water. There's no point in using a crock pot for this; the cooking time is too short. Only white French-style bread has the right body and flavour for this soup. This is NOT the place for your healthy multigrain sourdough bread -- I know, because I've tried it. I made the bread too!